This is a very decadent meal that's surprisingly easy to cook. Serve the fish with buttery mashed potatoes and asparagus for a delicious dinner. Place the garlic clove onto some tin foil along with some salt and some olive oil. Wrap the tin foil up like a parcel, and pop it into the oven at 180C for around 40 minutes. Once cooked remove it from the oven and set it to one side. Finely chop the shallots and place them into a frying pan with a little bit of olive oil. When they begin to soften, add the rosemary and then the wine. Bring it to a simmer. Meanwhile, heat some olive oil in a frying pan and season the fish well on both sides. Then, fry the fish fillets. They need around three minutes on each side. Whisk the butter into the wine and shallot mixture and mash the roasted garlic with the back of a fork. Add this to the mixture and then mix well. Serve the sauce spooned over the fish. The flavours of the rosemary and the garlic work brilliantly with the haddock. 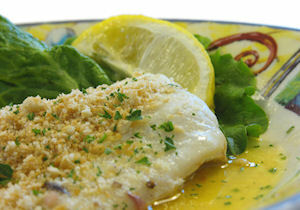 Back to the Haddock Recipes home page. It is not stated whether to reduce and strain the sauce or whether to serve direct from the pan. I reduced and strained it and it was very nice although a little sharp - that could have been the wine. Otherwise, very acceptable. Overall the flavours worked really well together, but I think the white wine sauce could have done with only putting in about 400ml of wine and about 75g of butter, just to make it a richer colour on the plate. Average rating of 4.00 stars based on 2 reviews. Summary: This is a very decadent meal that's surprisingly easy to cook. Serve the fish with buttery mashed potatoes and asparagus for a delicious dinner. Haddock meets leeks, peas and a creamy sauce with crispy, cheesy topped potatoes. What more could you want for your dinner? This recipe is full of classic flavours. Simply serve this with some asparagus and some new potatoes for an easy, delicious meal.